This screen allows you to update installed extensions. You will only be able to update extensions which support this feature.For extensions which support this feature, you will be able to perform an in-place update of the extension without having to upload and install the updated extension files like you did with previous versions of Joomla!. The update feature utilizes standard HTTP connection mechanisms to download the extension update files from a remote update server. 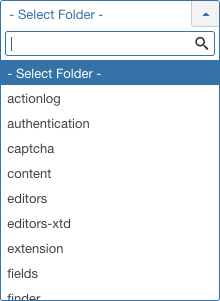 Select Extensions → Manage → Update from the drop-down menu of the Joomla! Administrator Panel. Or select the Update menu item in the Extension manager screen that appears. Type. The extension type. 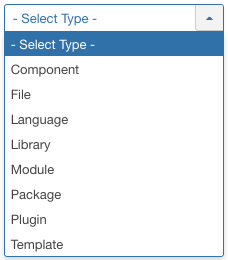 Examples of extension types are module, plug-in, template, component, language or package. Installed. The version number of the currently installed extension. Available. The version number of the available update. Install Type. The type of installation that will be performed by the update. Usually this will be type Update which will perform an in-place update of the extension. URL Details. The URL for the extension update XML file which contains the information needed by your Joomla! installation to perform the update. 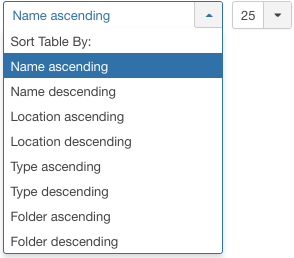 Above the column headers on the right, there are 2 drop down input fields, Sort Table by: (preset to Name ascending) and a number (preset to 25) to display. You can use one of the available filters or any combination of them to limit the number of extensions displayed to just the extensions which match your filter parameters. Update: Updates the selected extension(s). Find Updates. Scans your Joomla! installation and locates extensions with an available update. Clear Cache. Clear the available extension update information displayed in the listing. Only extensions which support the Joomla! update system will be listed in this screen. If you use extensions which do not support the new update system or you are not sure, consult the extension developer's website. It is critical to keep your extensions up-to-date. Failure to do so may expose a vulnerability in your Joomla! installation which can be exploited by hackers. It is recommended to backup your Joomla! installation files and database before attempting to update extensions or the Joomla! installation itself. This will ensure that you can restore your Joomla! installation to its previous state if the update fails or causes unexpected results. This page was last modified on 19 November 2018, at 12:54.